Meet Lydia Martin, one of our 2018 LEAP finalists and a featured artist in The Store from August to October! Martin’s work explores the tension between thinking and feeling. 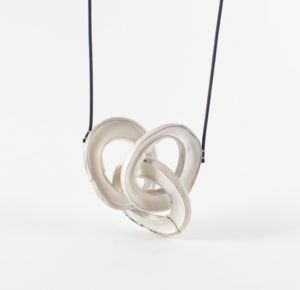 To her, jewelry mediates between the liminal space and everyday life when it is worn. With silver, Lydia creates undulating and fabric-like surfaces with defined edges that pull the viewer into the ambiguity of her work. Read on to learn more about Martin and her creative process. Stop by The Store to try on her beautiful and poetic jewelry! As a maker, I have become increasingly aware of the relationship between my hands and the jewelry I make. There is a shadowed space between maker and made, often meant to be invisible to both the trained and untrained eye. This space has always been uncomfortable for me, as a jeweler, as accuracy does not come naturally. However, it is from within this boundary that I have begun to find something honest. Paying careful attention to my material, sterling silver, manipulating in order to break, repair and reconstruct, making something whole that had once been turned into fragments. 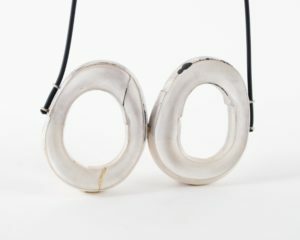 It is within this evidence, the evidence of my own hand, that my boundaries as maker, wearer, and thinker become clear finding voice within the jewelry I make. 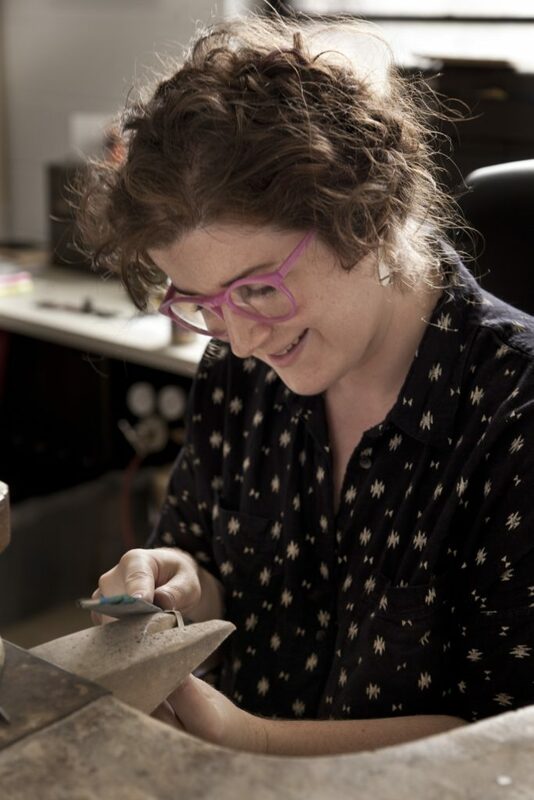 I feel incredibly fortunate to have completed my undergraduate and graduate training at two institutions, the Rochester Institute of Technology and the State University of New York at New Paltz, that are full of such rich and incredible jewelry and metalsmithing history. Learning and being taught by formidable women and men of our field over there, will forever influence the way I produce and think about my work. 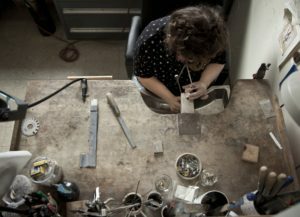 My undergraduate training left me a strong sense of foundational skills and a keen understanding of traditional jewelry and metalsmithing; it lent itself greatly to the way I construct and process pieces. The time in between undergraduate and graduate school coupled with the completion of my graduate training, allowed me to greater understand and question my own individual studio practice. It is from these experiences that I begun to understand how to translate my material and visual language into meaning. Why were you drawn to this medium? I was first drawn to metal in my freshman year of high school. My very best friend at the time had enrolled herself in a jewelry and metalsmithing course and being 14, she didn’t want to take the class alone so I opted to enroll with her. I remember that class very vividly, because it was my a-ha moment, everything made sense in a way that it hadn’t before. Jewelry, more specifically metal, offered me an alternative way of thinking. Each time I began a new piece, I was met with physical resistance and a problem to solve. Much of that work is now the work of my nightmares but I would be lying if I didn’t say I still own much of it. Abstract art, Minimalism, painting, sculpture, poetry, and photography have always been some of my greatest inspirations. I find it incredibly important to find inspiration beyond what I gravitate towards in the jewelry and metalsmithing field. I read often, mostly theory and a surprisingly large amount of science fiction, which often presents itself in a subconscious manner while working. Within the past year, I have been experimenting with implied movement and how to reframe and contextualize iconic jewelry forms. I have been constructing hollow links individually, creating movable chain, and then rendering them immobile into a solid mass through soldering. It has been my dream, and a goal I hope to slowly work towards, to create a full necklace out of these hollow links, allowing some to move and others to be solid. To add just one extra layer to this incredibly time consuming and costly dream, I would love to have the opportunity to make some or many of these links completely out of 18k gold! Tell us about your favorite artist or artists that inspires you. Agnes Martin and Hiroshi Sugimoto are two of my all time favorite artists. It doesn’t matter how many times I take books out of the library or see their work in person, I love it just the same. Objects that speak without words offer alternative languages and voices. Artists have the ability to speak for society in a way that is both powerful and empowering. This was by far the best and most influential piece of advice that I have received as a jeweler in conjunction to my own work. Fear is a strong deterrent and when you couple that fear with an economic factor, such as material expenses, it can make decision making incredibly difficult. 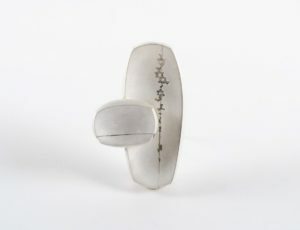 If I had not and do not think of my material, sterling silver, as just metal I would not have gotten to the point I am at today. Metal can always be recycled, refined, and reused; a practice I employ quite often. Play the long game. Try not to compare yourself to the person, or artist, sitting next to you and recognize that talent is just one part of the equation. I believe that as an emerging artist, it is important to look for and seek out opportunities in which there is exposure to the greater contemporary art and craft world. At this moment in time, The LEAP award and Contemporary Craft have the ability to project work further out into this world than I. The exposure offered and the potential dialogue around my work would be an invaluable opportunity. In addition, as a jeweler, my work is meant to move beyond my studio and be worn. 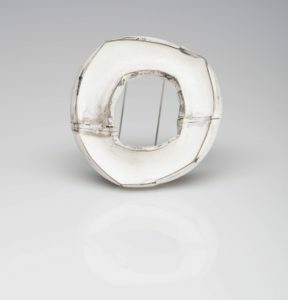 Having my jewelry in the Contemporary Craft will allow me access to an audience I didn’t have before. I hope that through this access and exposure that pieces find their homes and the work gets worn.